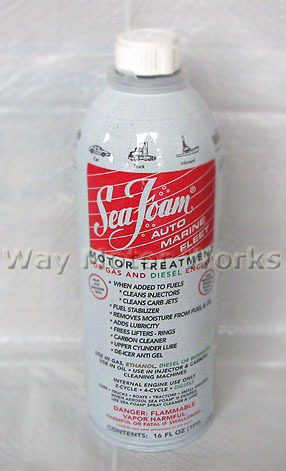 SEA FOAM Motor Treatment is a petroleum based product that helps clean internal fuel and oil system components. SEA FOAM is an EPA-registered product, and will not harm engine components, seals, gaskets, catalytic converters or oxygen sensors. SEA FOAM helps liquefy gum and varnish deposits helping to free sticky valve lifters and rings. By using SEA FOAM to help eliminate varnish and carbon buildup, mechanics can more accurately diagnose mechanical problems that may exist. That is why Sea Foam has been so popular with professional mechanics for over 65 years. As a fuel system additive, Sea Foam will help clean carburetor jets, fuel injectors, clean carbon, gum and varnish deposits, add lubricity to fuel, stabilize fuel for 2 years and control moisture. As an oil system additive, Sea Foam helps remove moisture,varnish and oil residue deposits. Many MINI owners have used this product to help clean carbon buildup in newer MINI's.